Here is a happy man, a man immersed in the blissful ache of focusing on something both difficult and ferociously beloved. He seems to have just laced a line drive to left field and is about to sprint toward first base with every fiber of his being. The photo is from the 1978 season, in which he attained the immortality-clinching milestone of 3,000 hits, and then went on to hit safely in 44 straight games, tying an 81-year-old National League record. Happiness comes and goes. The man pictured here had been born and raised in Cincinnati, and had at the time of this photo played for 16 seasons for his hometown team, winning a Rookie of the Year award, an MVP award, two World Series championship rings, two Gold Glove awards, three batting titles, and 12 National League All-Star team selections. In later years he would win another World Series title with the Philadelphia Phillies; would, while playing for the Montreal Expos, become only the second man to amass 4,000 hits; and would bring his career full cycle by returning to his Reds (I married into a Cincinnati Reds family, and I can tell you that even now the team belongs to nobody so much as to the man pictured here) to break Ty Cobb’s record for career hits, a record long thought impossible to approach, let alone break. But all this seems, in light of this 1979 card, something of an aftermath. An epilogue. He would play for another team the season this card came out, which broke the spell of permanence that Pete Rose had cast, that feeling that he always had been and always would be playing baseball with all his might for the Cincinnati Reds. He did not seem happy. 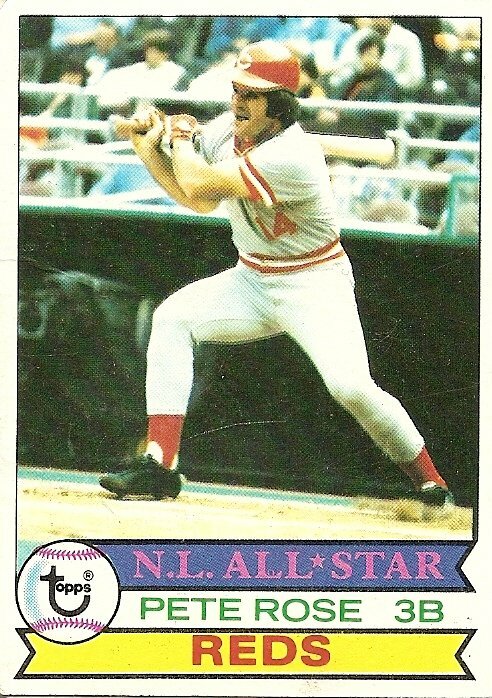 You are currently browsing the archives for the Pete Rose (Cin.) category.